This is about a 1990 Proline sport 210 center console boat, 21 ft. In all the years that I have had this boat, my wife and I and family have really enjoyed it. We have been 7 to 10 miles out in the Gulf of Mexico fishing in it and felt very safe, This boat handles quite well in the event of high waves. There are 2 coolers for ice, lots of storage space, a Loran, fish finder, 12-way radio, etc. 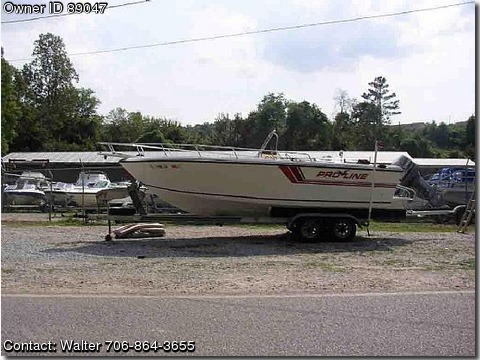 We have only used it once a year on vacation in the Gulf, the rest of the time we used it in Lake Lanier, which is fresh water.All this boat needs is someone to take care of it and it will pay you back in fun and pleasure as it has done for me and my family.